ORDER STYLE A: High quality FRUIT OF THE LOOM "BEST" T-shirt. Ash colored shirt with vivid 3 color design on the front. Front of shirt reads: Got Mud? Water? Snow? 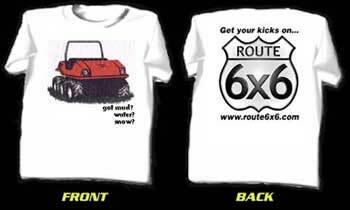 With the ROUTE6x6 Logo on the back side. Price includes shipping in the USA. See order page. ORDER STYLE B: SOLD OUT THE LOOM "BEST" T-shirt. Ash colored shirt with vivid 3 color design on the front. Front of shirt reads: Got Mud? Water? Snow? With the ROUTE6x6 Logo on the back side. Price includes shipping in the USA. See order page. OFFICIAL ROUTE6X6 black cap with full embroidery in white on the front. Price includes shipping in the USA. See order page. Covers early ATTEX, CAMEL, TERRA TIGER and the REB. This is a collection of old video clips. on the short course. Shows what performance some of the old machines had. Really neat! from the early 1970's. Shows the factory teams, with so many ATVs in a field that you can not really count them! Lots of mud action with jumping. This video contains the famous scene of the ATTEX doing wheelies in the pits. This racing videos features ATTEXS, MAXS, ARGOS TERRA TIGERS, SIERRAS, AMPHICATS, CAMELS, SCRAMBLERS, JIGERS, STARCRAFTS, CHAPPERALS, COOTS and many more vehicles. This video follows Marc Stobinski around the racing season, he allowed ROUTE6x6 to present it to you. Price includes shipping in the USA, see order page. Approx. 70m running time. VHS format only. All 3 of the above videos are included on one tape. Joel Haslett: Wrote this message about the above videos. This quote was used with Joel's permission: " Hi Richard, Last week for my birthday my wife got me both videos on the NATVA racing from Route 6x6. I have watched them about a dozen times so far. I really enjoy them . Each time I see something I missed before. Somewhere in the middle of the second tape there is a 6x6 that I don't recognize. It looks like an elongated Attex tub with the fender part cut off .The driver sits way to the rear and the two front wheels are spaced way to the front. Do you know what this machine is? Just currious. It also appears on page 12 of the NATVA program on the "Blast from the past " section of Route 6x6. Thankyou very much for the Videos. Joel Haslett. P.S. when does History of ATVs Part 2 come out? " Thanks Joe! ORDER ABS Plastic repair manual. ORDER ALSPORT TRACKER Parts list and Service manual. ORDER KAWASAKI Parts and Service manuals covers 440. ORDER KOHLER Owners manual covers 2cycle Singles. 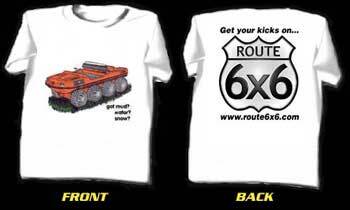 Click here for the "ROUTE6x6 PHOTO contest".